A Massachusetts native, Patricia Tobacco Forrester (born 1940) received her B.A. from Smith College (Phi Beta Kappa) in 1962 and her B.F.A. in 1963 and M.F.A. in 1965, both from Yale University. She was awarded a prestigious Guggenheim Foundation Fellowship in 1967. 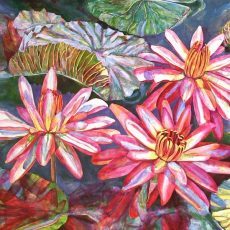 The artist's critically acclaimed watercolors are painted directly from nature, often on very large scale sheets of up to 40 x 60" paper. Her subject matter is primarily trees and flowers against a dramatic landscape vista, painted with an intuitive, lush, expressive sensibility. The artist travels to exotic locales many months of the year, though her home base has been Washington, DC, since 1982. From the mid-sixties to 1981 she lived in San Francisco and she often returns to the region to paint the rocky coast of Santa Barbara or the rolling vineyards of the Napa Valley. She spends her winters painting in warmer climes, often island hopping in the Caribbean and traveling throughout Central and South America, as well as occasional sojourns in France and the Mediterranean. Forrester accepted the invitation to become a member of the National Academy of Design in New York in 1992. Her work has been shown widely in hundreds of museum and gallery exhibitions across the United States and abroad for over thirty-five years. Numerous major museums own her paintings and prints, including the Art Institute of Chicago, British Museum, London, Brooklyn Museum, Fine Arts Museums of San Francisco, Indianapolis Museum of Art, Library of Congress, National Academy of Design, Oakland Museum, Yale University Art Gallery, and the National Museum of Women in the Arts, the Smithsonian American Art Museum, the Corcoran Gallery of Art, and The White House, Executive Office Building in Washington, DC. Steven Scott Gallery has been honored to represent the artist since its opening in 1988. Solo shows of Forrester's watercolors and lithographs were mounted in 1992, 1997 and 2005. A color brochure is available upon request. Forrester is the recipient of a 2005 Artist Grant from the DC Commission on Arts and Humanities.